When we moved into our house about six years ago, the most imposing feature in our small front yard was (is!) a huge magnolia tree that was planted, I was told, about 45 years ago (yes, it’s as old as I am, what an odd coincidence, huh?) by the previous owners and never pruned. I used to think this tree was such a nuisance because it is so messy. Its fallen leaves suffocate my herb plants and flower beds. However, recently I have come to look at it as a symbol of my quest to find alternative treatments for my MM. Why? 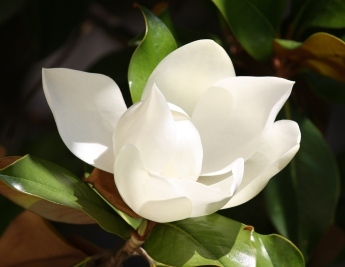 Because magnolia trees contain a very important active component called honokiol, extracted from its bark and seed cones. Honokiol has been used for about two thousand years in China and Japan to treat a variety of disorders â‚¬”anxiety, nausea, fever, coughs, headaches, digestive problems, etc. In 2005, a study carried out by a group of researchers at the Dana Farber/Harvard Medical School and published in Blood revealed that honokiol induces apoptosis in B-cell chronic lymphocytic leukaemia cells (http://tinyurl.com/3dqfdm), without killing normal B-cells (good news!). Another bit of good news is that low doses of honokiol increase the cytotoxicity potential of three chemo drugs used in B-CLL. A few months later, a study on honokiol and MM was published in Blood (http://tinyurl.com/2kgdoh). A group of researchers found that honokiol has antioxidant, antifungal and antibacterial properties (sound familiar? Yep, curcumin!). Their most significant discovery, however, was that honokiol inhibits growth and induces apoptosis of MM cells. Honokiol, or HNK, was also found to enhance the anti-MM properties of bortezomib (Velcade). The growth of MM cells taken from patients with relapsed/refractory MM was also greatly reduced by honokiol. And I would like to underline that normal cells treated with honokiol were not negatively affected. More similarities with curcumin, which affects only cancer cells. The study concludes that HNK induces apoptosis via caspase-dependent and -independent pathways in MM cells. It induces cell death in drug-resistant MM cells and overcomes the growth-promoting activities of IL-6, IGF-1, and BMSCs; its antiangiogenesis activity further supports its anti-MM potential in the BM milieu. These results suggest that HNK, used either alone or in combination with other drugs, represents a promising novel targeted approach to overcome drug resistance and improve patient outcome in MM. A 2006 study (http://tinyurl.com/3xyxcc) reports that the NF-kB and NF-kB-regulated gene expression inhibited by honokiol enhances apoptosis and suppresses osteoclastogenesis and invasion. Another osteoclastogenesis inhibitor. Well, well. However, how do we figure out dosages and how can we be sure that what we buy is absolutely pure and safe? Good question. And what about side effects (apart from possible drowsiness, which I did read about) with high doses of honokiol? Another good question. There are currently no clinical trials testing honokiol, which I think is a shame, given its potential in vitro and in vivo. Perhaps I should just begin chewing on the bark from my magnolia tree. Update, July 20th 2008 post: A July 14 Science Daily article (see: http://tinyurl.com/5dy7xo) tells us that honokiol, extracted from the magnolia tree and used in Eastern traditional medicine for a variety of ailments, has recently (?) been found to target tumors with activated Ras. And Ras refers to a family of genes whose mutation stimulates the growth of several types of cancers. Although the Ras family is mutated in around a third of human cancers, medicinal chemists have considered it an intractable target. Is Ras active in myeloma, too? I will give you one guess. Then you can go read this 2004 abstract: http://tinyurl.com/5sz6z7. Or this 2006 “Blood” study where we find that Oncogenic RAS expression occurs in up to 40% of multiple myeloma (MM) cases and correlates with aggressive disease: http://tinyurl.com/6otz4y. I rest my case.